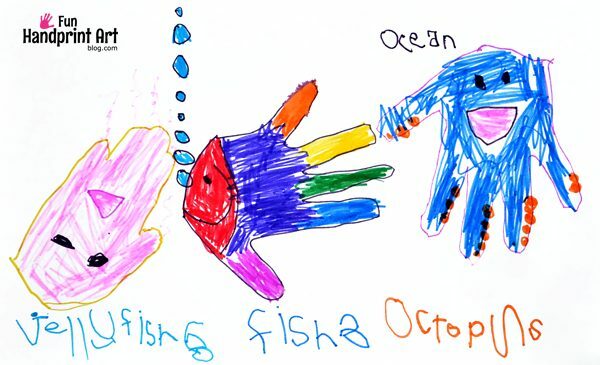 Big Brother has been fascinated with hand drawings since about 4 years old. His favorite to draw are turkeys and he’s got quite the collection going! To change things up, I bought him the book Hand Art (Chicken Socks)* which has some really cute hand drawings in it. He was 4 when I bought it and 3 years later I still find him drawing the animals in the book! *This post contains affiliate links to the book mentioned. Please read our full disclosure policy here. 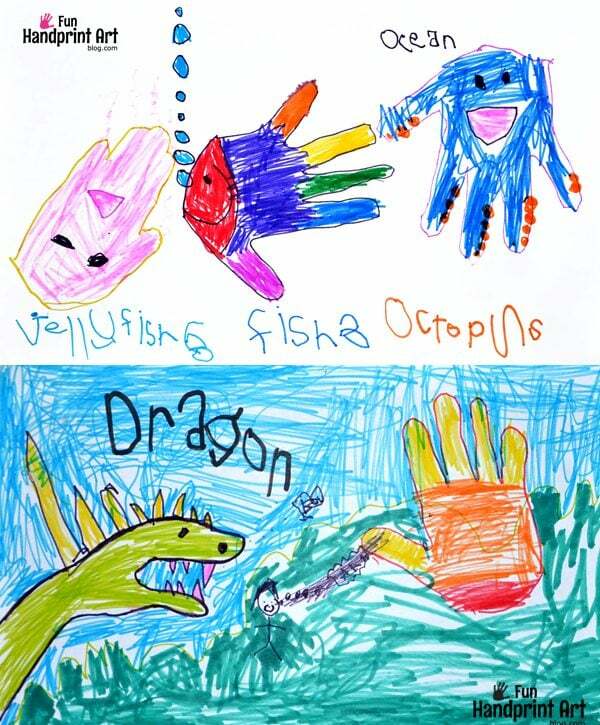 This handprint ocean drawing and dragon scene were inspired by crafts from the book. He made both of these when he was 5 years old. I think that it would even be fun for a 3 year old with a little help from someone older. I love how he drew himself with a scream coming out…tee, hee! 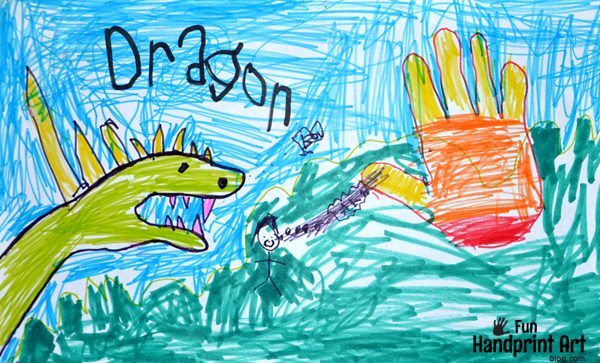 The red, orange, and yellow hand is what he drew when I suggested drawing fire. I actually pictured it coming out of the dragon’s mouth, but his idea is fun too! It’s neat to look back on how much hi writing has changed since then. Most are animals made by tracing the hand and coloring them in like a coloring book. Some are the whole hand and some are made by tracing the fist yet others are made like the dragon. There is a small photo at the bottom of each showing how you will be doing the tracing for that hand art. The book also comes with googly eyes, glue, pom poms and crayons to make each with. There are none pictured in these particular drawings because he used them in a previous drawing. Instead, he drew those features on. You can also add your own googly eyes to it. I love that it comes with everything you need! See more hand drawings here!